Richard Snyder of Janesville shows designs for the 200-square-foot ‘tiny homes’ he hopes to build in Janesville as transitional housing for local homeless people. When it comes to his idea of building a small village of tiny homes for homeless people in Janesville’s Fourth Ward, Richard Snyder might have to take his plans back to the drawing board. Some who live near the proposed site of his tiny home enclave told Snyder on Tuesday night he should retool his plan by finding a location outside the Fourth Ward. Many in a group of about two dozen Fourth Ward residents made it clear to Snyder during a meeting of the Fourth Ward Neighborhood Action Team that they do not want to live near a cluster of four 200-square-foot homes that would be managed as transitional housing for people recovering from homelessness. Residents said they would like to see homeless people find help, but they fear a village of tiny homes could bring crime, public intoxication, drug use and other bad behavior into the Fourth Ward if it isn’t managed properly. Snyder laid out his proposal to build the small houses, telling residents during the meeting that he has raised $5,200 for the project, he has designs in the works for the village, and that the owner of a residential lot on South Franklin Street has promised to donate land for the project. He said a Janesville nonprofit is considering owning and managing the homes as recovery housing for homeless people. The group, which met in the basement of the All Saints Anglican Church, had a barrage of questions for Snyder and a clear message from some in the Fourth Ward who would live closest to the proposed tiny homes. They said they’re not on board. Jessica Jones said she would live right next door to the site. She said a nearby homeless drop-in center that once was in the Fourth Ward, but no longer is, brought a host of problems to the neighborhood—including, she said, intoxicated people she would find passed out in her driveway. Jones doesn’t want “alcoholics breaking into my yard,” used syringes laying around the property, public defecation or increased crime—problems Jones said she has read are linked with some tiny home villages around the country. Jones said she wants to see homeless people get help, but she’s more interested in protecting her children. “I’m not willing to risk the safety of my family on good intentions,” she told Snyder and Jim Crittenden, a Janesville resident partnering with Snyder on the project. Jones and others said they were disappointed Snyder had not approached them about the project and its location before he went public with the plan. Jones said she thought Snyder was “getting really ahead of things” by unveiling a plan before he had a firm commitment from a social service nonprofit to manage and operate the tiny homes. Snyder gave the Fourth Ward residents a book of sketches that show what the homes would look like, and he told them the plan still faces multiple city planning and zoning hurdles. Snyder said he has looked at multiple locations for the proposal, but he chose a vacant, 8,800-square-foot lot in the Fourth Ward located just west of the Ace Hardware store at 200 S. River St. because the lot’s owner offered to give the land away if a nonprofit took over the property. Snyder told the residents he has been in talks with GIFTS Men’s Shelter, an agency that runs a homeless shelter on Janesville’s west side. Snyder and Crittenden said the agency hasn’t committed to managing or operating Snyder’s proposed tiny homes. Snyder said he never planned to manage the homes himself. He said he likes the idea of a group like GIFTS running the tiny homes because the agency has expertise helping homeless people recover and it has strict rules within its programs that prohibit its clients from using drugs and alcohol. Bob Stenzel, another Fourth Ward neighbor, told Snyder he’s concerned that loopholes in fair-housing laws might make it hard for a manager of the tiny homes to evict people who misbehave or backslide into behaviors that might have led them to become homeless in the first place. Resident Billy Bob Grahn, who runs a drug and alcohol recovery home in Janesville, pointed out that a high number of homeless people have mental health and substance abuse problems, including alcoholism. Grahn said he believes sudden isolation in housing can come as a shock to people recovering from addiction and homelessness. He believes Snyder’s proposal might make more sense if it included on-site managers who worked hand-in-hand with residents every day. “Anything less than that, and you’re gonna hurt them,” Grahn said. Others, including Jones, told Snyder his project should have more than just four tiny homes and that Snyder should consider an on-site service center for residents. Snyder said he never imagined Fourth Ward residents would have such opposition to tiny homes. He said he’s sorry if his plan has caused “heartache” among residents. Snyder said he plans to go forward on the project even if he has to find a different location or expand plans to include on-site resources for residents. President Donald Trump is calling on Republicans to revive the effort to quash the Affordable Care Act, handing Democrats an opportunity to unite in defense of the law as they try to move past the recently concluded Russia investigation and win the White House in 2020. Trump’s administration is asking a federal appeals court to strike down the entire health care law. The president vowed Tuesday to make the GOP the “party of health care” and told Senate Republicans to lean in to their own agenda on the issue as they head into next year’s election. The moves could help Trump rally his conservative base as he celebrates Attorney General William Barr’s summary of special counsel Robert Mueller’s report that said there was no evidence the president or his associates colluded with Russia in the 2016 campaign. But the push also poured political kerosene on an issue that many Democrats credit with powering their midterm election victories in November. The Supreme Court has twice upheld President Barack Obama’s health care law, known as “Obamacare.” Five justices—a majority—who upheld the law in 2012 are still on the bench. Republicans gained Senate seats last fall, but there’s no indication that GOP senators want another fight over repealing Obamacare—particularly not those up for re-election next year. The GOP also lost control of the House, which means any attempt to dismantle the law would be doomed in that chamber. Vehicles drive past a sign showing a 60 mph speed limit while traveling south into Illinois on Interstate 90/39 on Tuesday. The gas tax would go up by nearly a dime a gallon by early 2021 under Gov. Tony Evers’ budget—about 2 cents more than the Democratic governor has talked about as he has promoted his two-year spending plan. Under his plan, the state would begin to put $500 million toward expanding Interstate 43 north of Milwaukee and keep other large projects on schedule, according to a detailed analysis released Tuesday by the nonpartisan Legislative Fiscal Bureau. Evers’ transportation plan—like his overall budget—faces an uncertain future in a Legislature dominated by Republicans. GOP lawmakers have been split for years on road funding with some wanting to find more money for highways and others wanting to hold the line on spending. To put more money toward roads, Evers would raise the gas tax by 8 cents a gallon initially and another 1.6 cents by early 2021. In all, the gas tax would go up 9.6 cents by then, from 32.9 cents to 42.5 cents. In an attempt to keep gas prices down, Evers is also proposing eliminating the state’s minimum markup law on gasoline. That law requires retailers to increase the price of gas in most cases by 9.18 percent above the average wholesale price. Evers contends that change would lower gas prices by 14 cents a gallon—meaning overall gas prices would fall even with his proposed increases in the gas tax. How the situation would actually play out remains unclear because retailers don’t have to raise their prices if they are matching competitors’ prices. Evers’ plan would also restore what’s known as indexing—a system designed to automatically increase the gas tax by an inflationary amount every April. The state had such a program for 20 years but ended it in 2006 under a bipartisan deal. 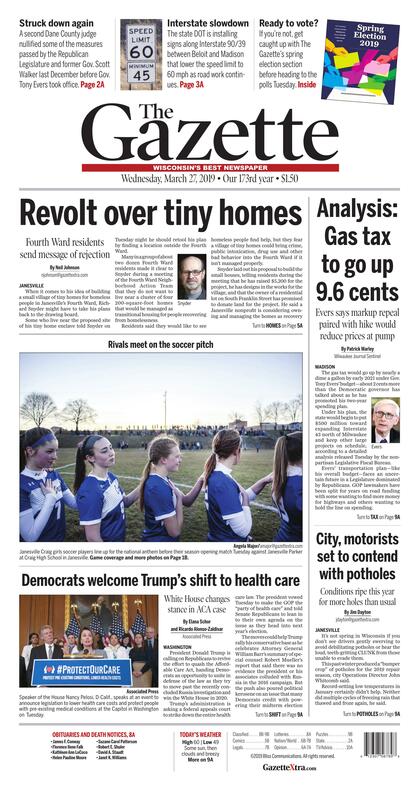 Evers has talked about raising the gas tax and restoring indexing, but Tuesday’s report was the first time a figure had been put on restarting the program. Indexing would cause gas taxes to rise by 0.8 cents a gallon in April 2020 and the same amount in April 2021, the fiscal bureau found. Evers’ plan would bring in an additional $608 million for transportation over two years. Most of that amount—$527 million—would come from the higher gas tax, with the rest coming from fees on heavy trucks, hybrid vehicles and vehicle titles. Fees on heavy trucks would go up by 27 percent—an increase of $42 to $692 per truck, depending on its weight. Evers wrote the budget in a way that would also apply the higher taxes to light trucks, but his administration has said that was a mistake and would be dropped with an addendum to the budget, according to the fiscal bureau. Lawmakers two years ago established fees of $100 for electric vehicles and $75 for hybrid vehicles, but the Department of Transportation wasn’t able to impose the fee on hybrid vehicles because lawmakers wrote the measure in a way that made it difficult to identify which vehicles owed the higher fee. Evers is proposing tweaking the phrasing of the measure so the department can start collecting those fees. Evers wants to raise vehicle title fees by $10, from $69.50 to $79.50. GOP lawmakers have suggested they might not go along with Evers’ plans. If they don’t, they would need to find other sources of funding, delay projects or ramp up borrowing. The report also noted Evers’ plans to widen I-43 from Silver Spring Drive in Glendale to Highway 60 in Grafton would cost about $500 million. Evers wants to spend $56 million over the next two years to get the project started. State Department of Transportation officials had declined before Tuesday to provide an estimate of the cost of the project. The influx of cash Evers included in his budget would allow other large projects to stay on their current schedules—including the north leg of the Zoo Interchange in Milwaukee, which is to be finished in 2023. Under his plan, Highway 441 in the Fox Valley would be completed by 2020, Highway 15 in Outagamie County would be completed in 2021, Highway 23 in Sheboygan and Fond du Lac counties would be completed in 2023 and Highway 50 in Kenosha County would be completed in 2023. The bulk of the expansion of Interstate 90/39 between the Illinois state line and Madison is to be completed by 2021, but the DOT has not settled on a final plan for the project where it connects to Madison’s Beltline. That raises the possibility that part of the project could be delayed, the fiscal bureau noted. In addition, Evers is recommending giving local governments a 10 percent increase in aid to help them fill potholes and fix roads in their communities. The increase would cost $66 million. He wants to give transit systems a 10 percent increase in state aid at a cost of nearly $14 million. In this Feb. 27, 2018, photo, a Janesville Public Works Department crew fills a pothole near the intersection of Reuther Way and Beloit Avenue in Janesville. A nasty winter has produced a bumper crop of potholes this year, city Operations Director John Whitcomb says, and he encourages residents to report them via the city's website. It’s not spring in Wisconsin if you don’t see drivers gently swerving to avoid debilitating potholes or hear the loud, teeth-gritting CLUNK from those unable to evade them. This past winter produced a “bumper crop” of potholes for the 2019 repair season, city Operations Director John Whitcomb said. Record-setting low temperatures in January certainly didn’t help. Neither did multiple cycles of freezing rain that thawed and froze again, he said. Potholes form when moisture seeps into a crack in the pavement. When the water freezes, it causes the pavement to expand. The swelling decreases when the water thaws, but this can leave a gap between the surface pavement and its underground base. Drivers repeatedly traveling over this uneven surface eventually wears out the pavement and causes a pothole. Janesville has two methods of filling potholes. One is a traditional “throw and go” shovel crew, which fills the hole with hot asphalt, Whitcomb said. Crews are still using a “cold asphalt” mixture for winter because asphalt plants have not opened yet for construction season. This mixture is still heated before being applied, but it’s less durable and is a temporary solution. Crews often have to redo these patches throughout winter, he said. Asphalt plants will open soon, giving city crews access to hot asphalt. The other method is a spray patcher, which disperses a mixture of emulsion and stone into the hole. It’s a one-person operation controlled by a joystick inside the vehicle cab, he said. The spray patcher produces a higher quality, more durable patch than hot asphalt. It is often used on concrete streets. How long these patches last depends on traffic volume and the strength of the surrounding pavement. Their lifespans vary, but they can sometimes last for several years, Whitcomb said. To help the city repair as many potholes as possible, residents can provide the location and other details in an online reporting form on the city’s website. Janesville has used the system for years, he said. The city eventually will repair all potholes that are reported, but it prioritizes main streets and severe potholes. The timeline for fixing them? “As soon as possible,” Whitcomb said. He stressed patience because the city has limited equipment and manpower. He acknowledged potholes are a high priority this time of year. The department is considering adding another piece of pothole equipment in 2020 if it can squeeze out funds, Whitcomb said.